Istanbul, Turkey-based designer (b. 1993, Bandirma) who studied fine arts at Marmara University and set up his own commercial typefoundry in 2014. 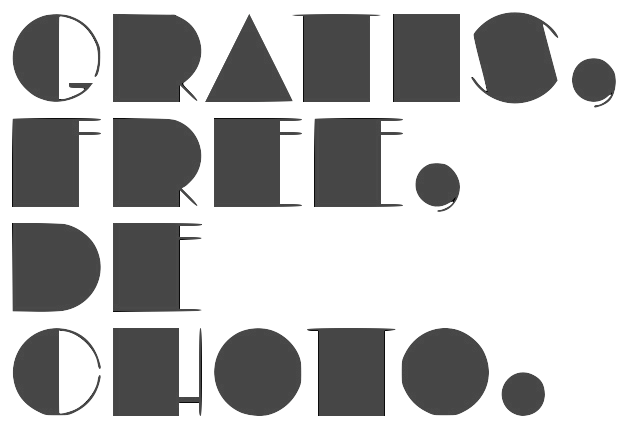 Creator of the free poster font Bakunin (2014: Regular, Outline, Stencil), which is named after anarchist philosopher Mikhail Alexandrovich Bakunin. 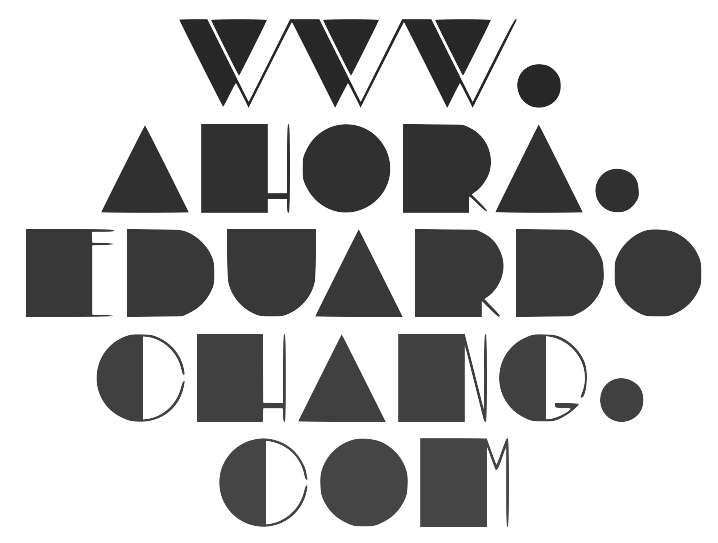 In 2015, he created the deco typeface A Demetracopulo, named after the architect, and the octagonal typeface Rolanti. Dori Novotny (Budapest, Hungary) started her studies at the Hungarian University of Fine Arts, Budapest, in 2010. She created a typeface to honor Bruno Munari (1907-1998) and took inspiration from Munari's grids. 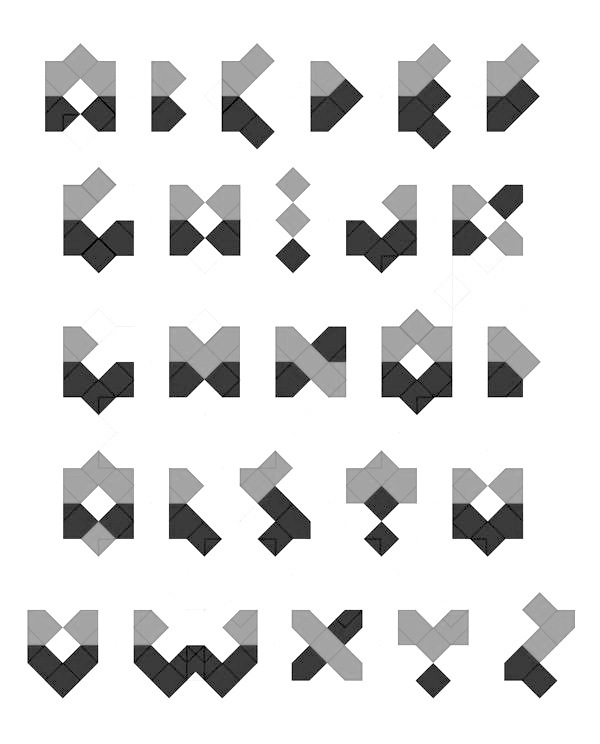 The new grid-based typeface is called Munari (2013). 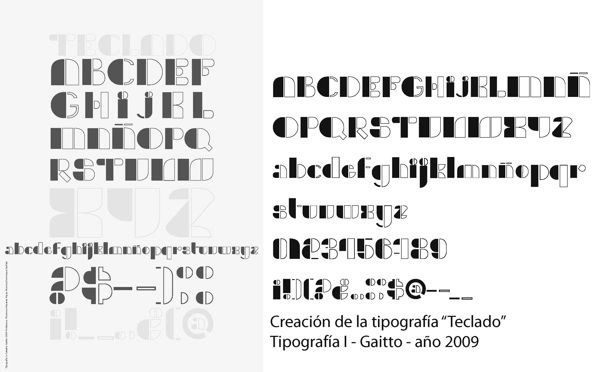 In 2012, she designed the stylized geometric typeface Ritmo. Japanese foundry, formerly Alt Rivet. Superb free fonts: Route 159 (2016, a sans designed for legibility), Eunomia (2013, a sci-fi sans), Seshat (2012), Penna (2011, beautiful hairline sans), Ferrum (roman capitals inspired by the logo of the Final Fantasy series), Medio (didone), Vegur (sans), all developed from 2004 until 2011. 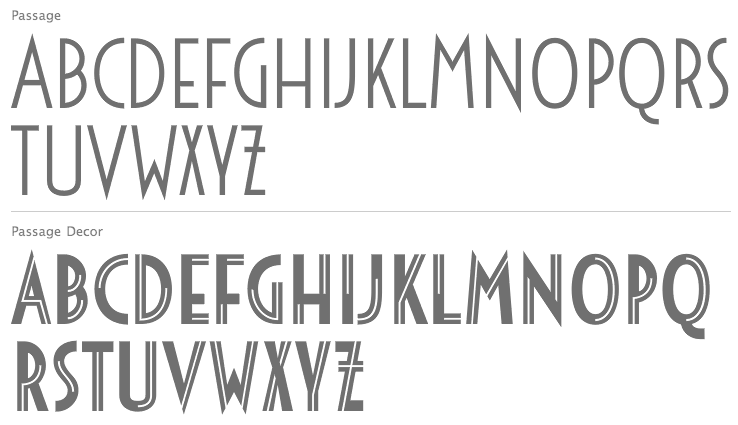 Tenderness (2007) is a high-legged beauty of art deco heritage loosely inspired by Garamond and Optima. In 2014, Seshat became available via TipoType and in 2016 vie Open Font Library. They published the sans family Aileron in 2014 as well. 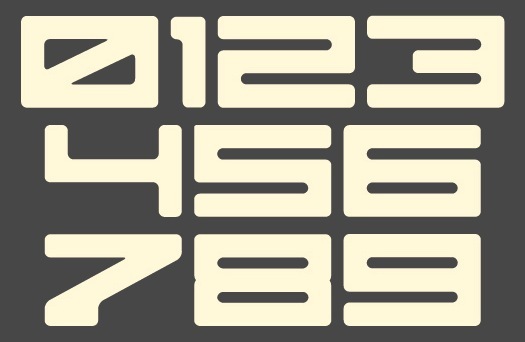 Open Font Library link for Aileron. Corporate identity and print design company, est. 2003 in New York City by Kevin Dresser and Kate Johnson. The foundry is located in New Paltz, NY. Kevin Dresser (b. 1971, Rochester, NY), its head, was a type designer at Hoefler Type Foundry from 1997 until 2000, when he started Dresser & Sons. His work there included art deco typefaces and iconography for the signage program at Radio City Music Hall, a redesign of the classic Cheltenham typeface for The New York Times Magazine, a custom typeface in Hebrew for the Rodeph Sholom Synagogue, a grunge typeface for Florent Restaurant, custom typefaces for Architectural Design Magazine, iconography for The Museum of Modern Art, lettering for TypeCon 2005, and a few retail typefaces. In 2003, he published the 15-weight sans family General at Thirstype, which is now also available for licensing from Dresser Johnson. Kate Johnson is a graphic designer who graduated from the Rhode Island School of Design. Acta, Acta Display and Acta Poster (2011, +Poster swashes). A didone fashion mag family. 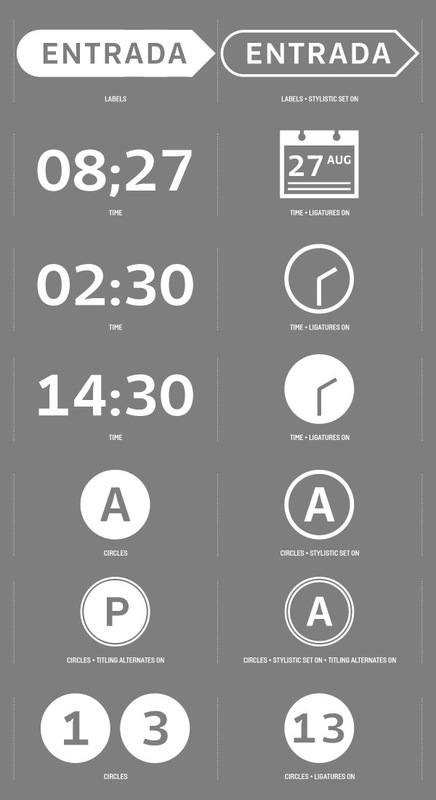 First designed for Chilean newspaper La Tercera in 2010, DSType's Acta family is a clean information design type system. It includes Acta Symbols, an extensive dingbat family. Acto (2012). 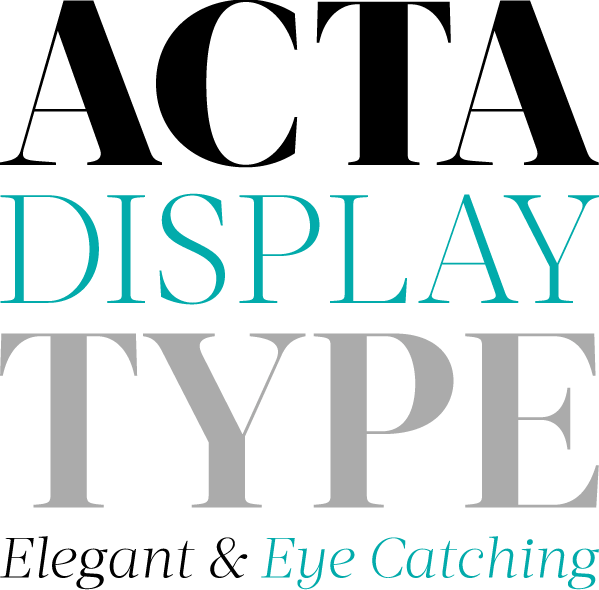 Acto is a type system designed as the sans serif counterpart of the previous released Acta. 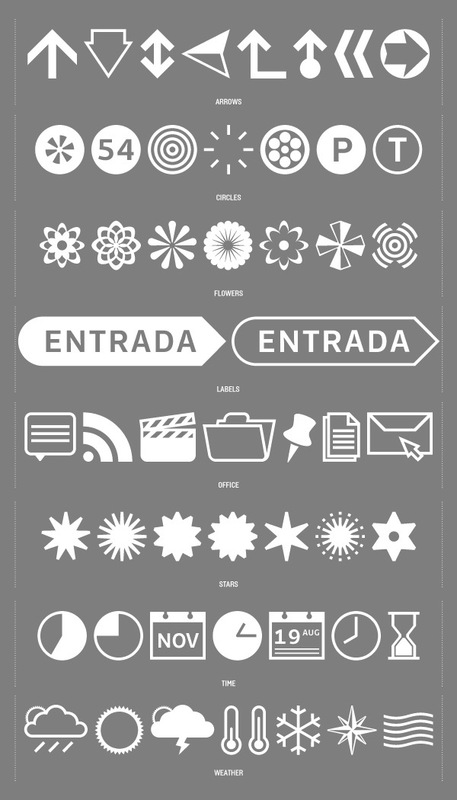 Both type families were designed in 2010 for the redesign of the Chilean newspaper La Tercera. 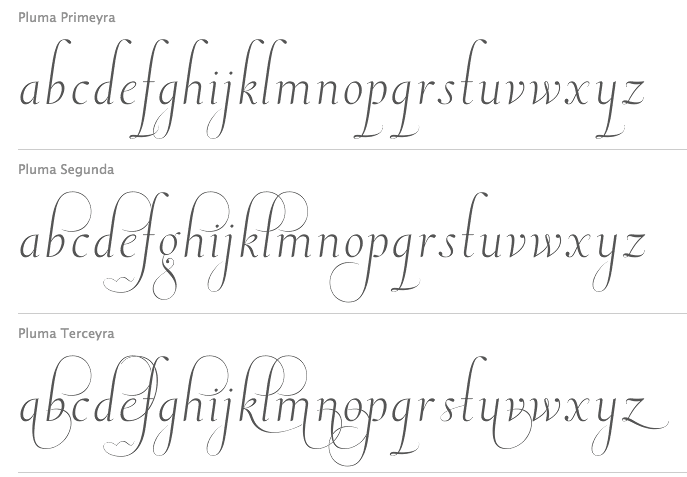 Andrade Pro (a modern) and Andrade Script Pro: based on the calligraphy of Andrade de Figueiredo, ca. 1722. Anubis (2003): a unicase face. Aparo (2013). 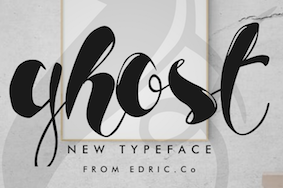 A plumpish elegant high-contrast script face. 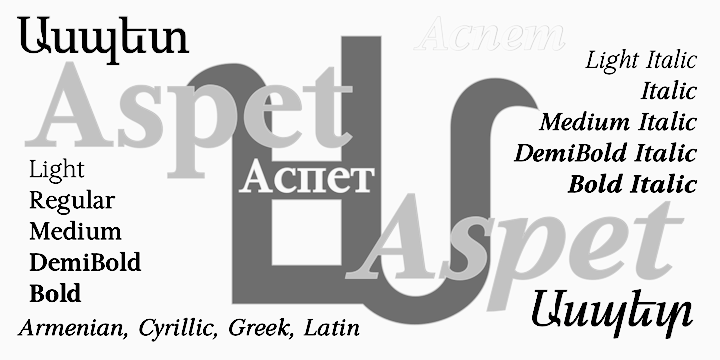 Apud and Apud Display (2010): a high-contrast serif family. Ardina (2016). 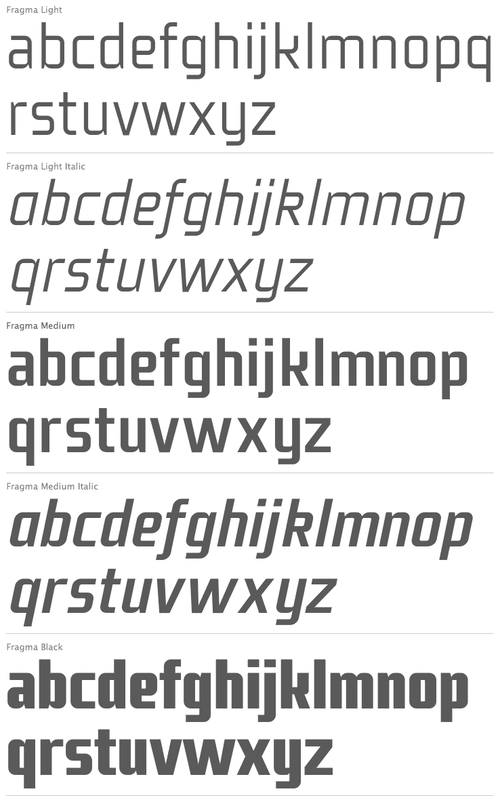 Done with Pedro Leal, this text typeface family has three optical sizes. Boldina (2004). 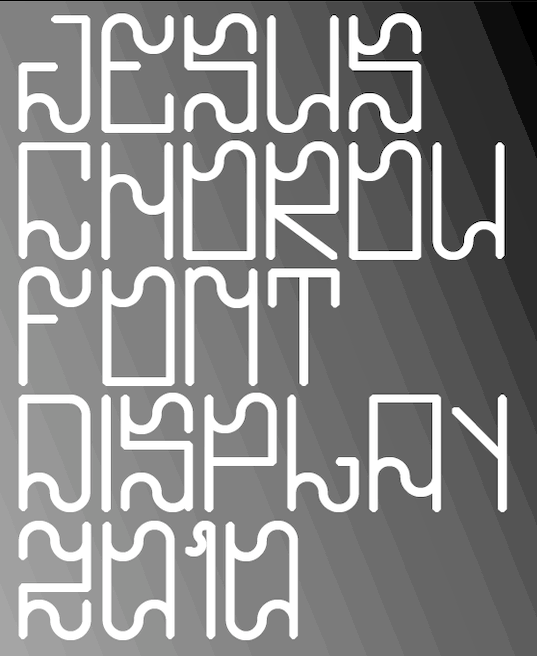 A fat informal poster family with 18 weights and styles. Braga (2011, Dino dos Santos and Pedro Leal). This is a layered font design family. Dino writes: Braga is an exuberant baroque typeface, named after a portuguese city, also known as the baroque capital of Portugal. Our latest typographic extravaganza comes with a multitude of fonts designed to work like layers, allowing to insert color, lines, gradients, patterns, baroque, floral swashes, and many other graphic elements. 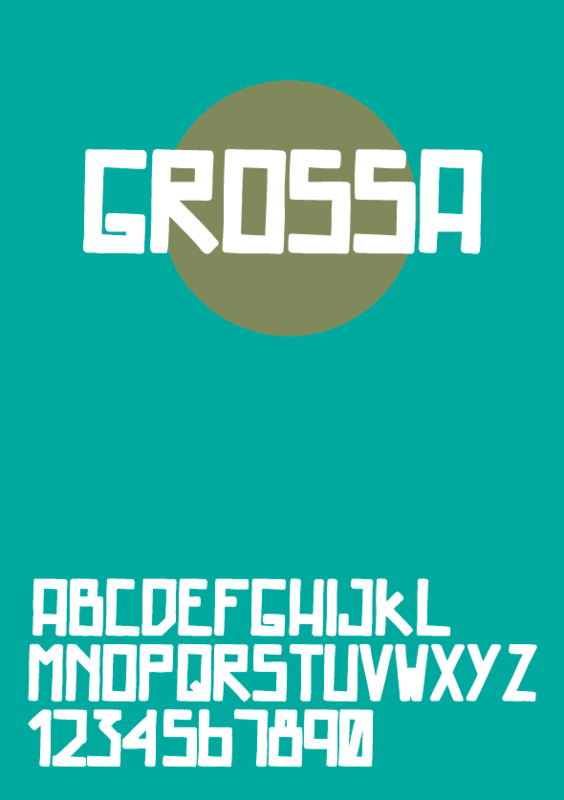 Starting with Braga Base, you can add any of the twenty-three available styles, to create colourful typographic designs. A type system from 2014: Breve News, Breve Display, Breve Slab Title, Breve Sans Title, Breve Title, Breve Slab Text, Breve Sans Text, Breve Text. The Breve system includes modern design elements in the skeleton and ball terminals, transional elements, almost wedge-serifs in the serifed styles. 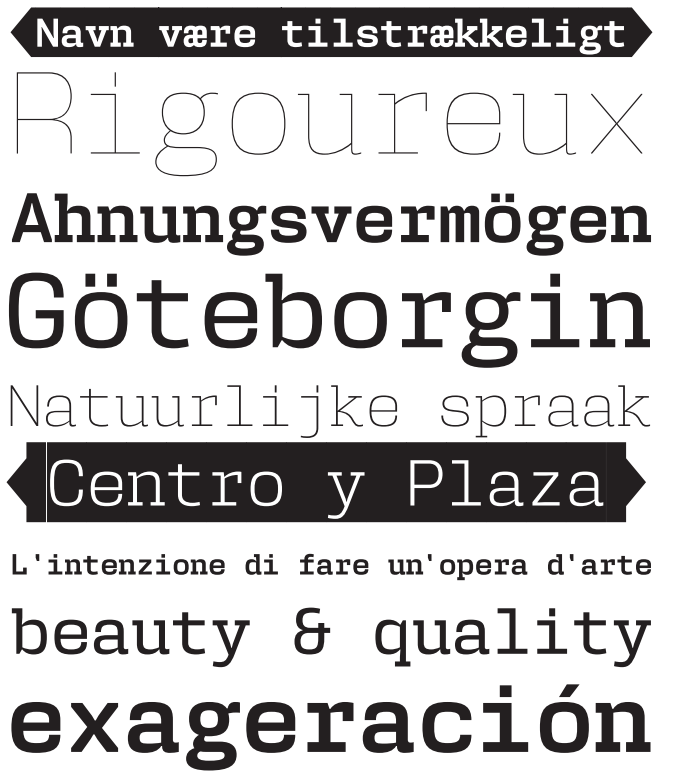 As with most of dos Santos's typefaces, even the sans and slab styles exhibit Latin warmth and exuberance. Capsa (2008): a family that was inspired by, but is not a revival of the Claude Lamesle types Gros Romain Ordinaire and Saint Augustin Gros Oeil. Ception (2001): a futuristic sans family. Cimo (2017). A distinguished condensed sans. 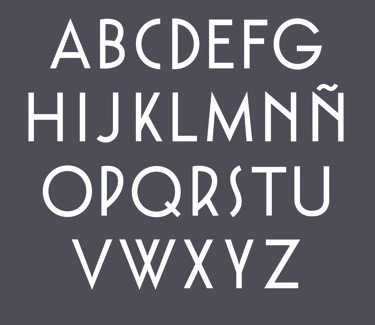 Cultura, and its improved version Cultura New (2013), a text book typeface family. Denso (2019). By Dino dos Santos and Pedro Leal: a great condensed variable font with weight, serif and optical size axes. 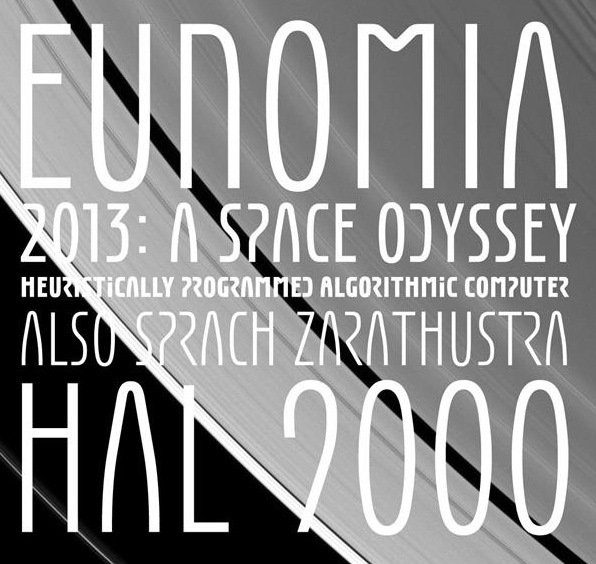 Dione (2003): a sans; redone in 2009 as Dobra at TypeTrust. See also Dobra Slab (2009). Esta (2004-2005): extensive (transitional) text and newsprint family. 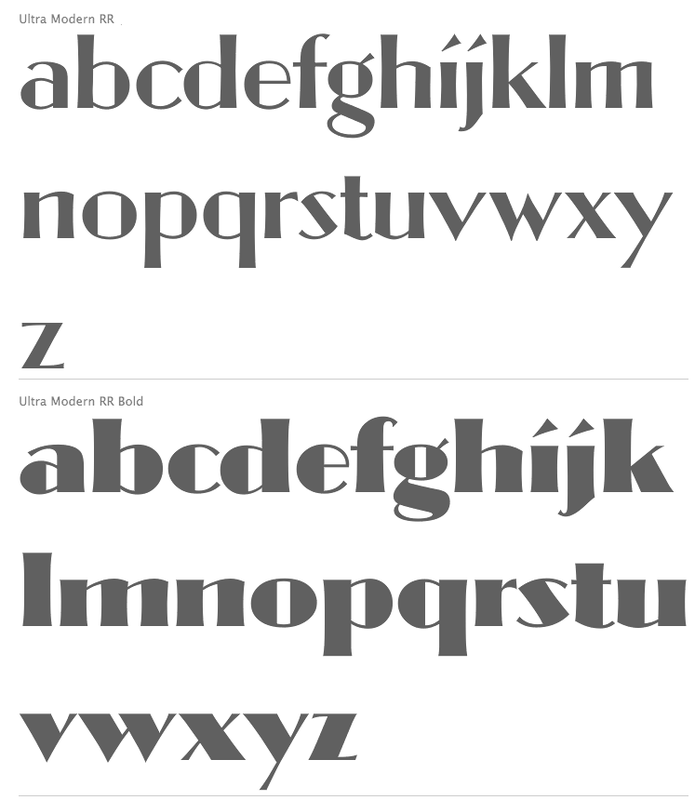 Estilo (2005): a gorgeous and simple art deco-ish geometric headline face. 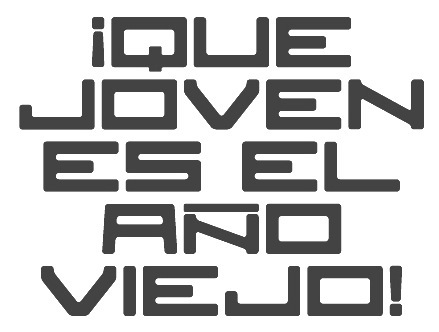 This was accompanied by Estilo Script (2006), Estilo Text (2007, a 6-style rounded sans family), and later, Estilo Pro (2010, +Hairline). 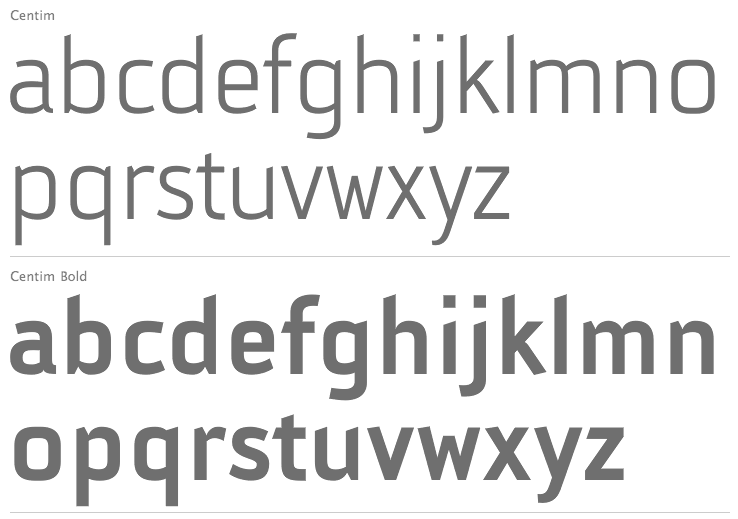 Finura (2009): this typeface has hints of University Roman. Firme (2014). A geometric sans for corporate use. Fragma (2003): squarish techno family. Girga (+Italic, +Engraved, +Banner, +Stencil) is a strong black Egyptian family designed in 2012 together with Pedro Leal at DS Type. Glosa (2008): Glosa is a meaty multi-style didone family. Glosa Text and Glosa Headline all followed a bit later in 2008, and Glosa Display in 2009. Hades (2012). 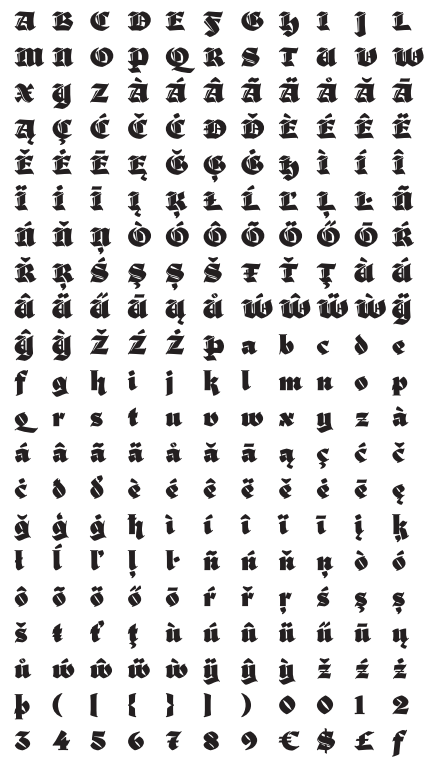 A yummy and free blackletter typeface. Ines (2015). 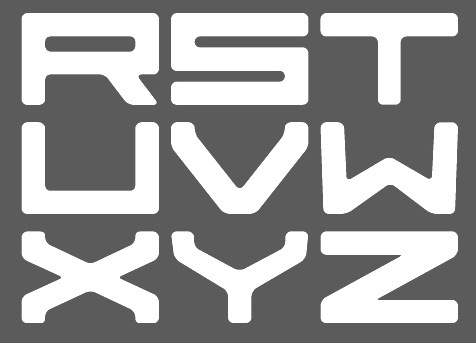 A classic 7-style text typeface. Isento and Isento Slab (2017). Bothe loosely based on ATF's Times Gothic. Quase (2017). 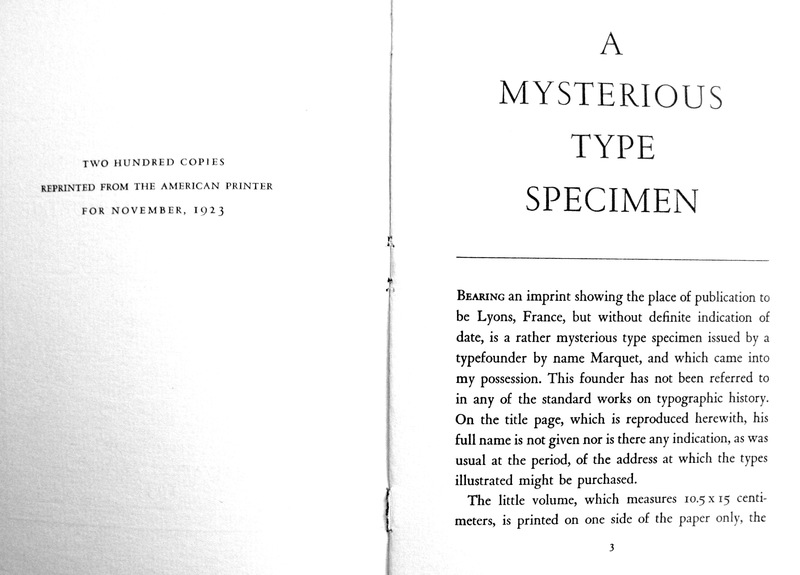 Loosely based on William Caslon's Specimen of Printing Types (1785). 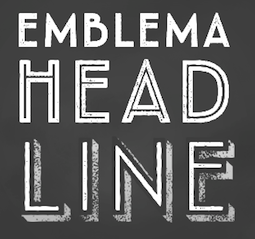 With a larger-than-Caslon x-height and reduced descenders, it comes in Display, Text, Headline and Poster substyles. Dino dos Santos and Pedro Leal published Jules in the summer of 2015---a fat fashion mag didone 45-style family inspired by several plates from Portuguese calligrapher Antonio Jacintho de Araujo; it comes in Big, Colossal and Epic. They followed up in 2017 with Jules Text. 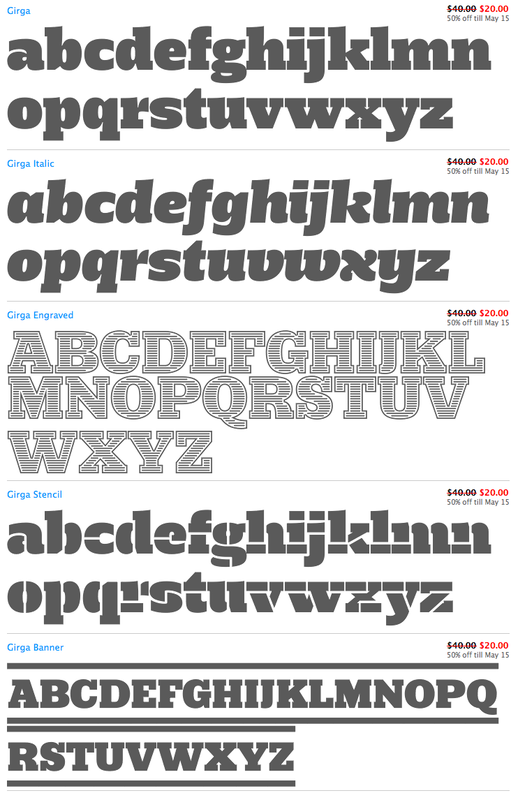 Kartago (2005): based on Roman inscriptions from Cartago. Keiss (2017). A Scotch roman with a lot of contrast. Large (1999) and Large Pro (2006). Leitura, Leitura Headline, Leitura News, Leitura Sans, Leitura Symbols, Leitura Display (2007): the 31 styles were all made in 2007. Logica (2016). 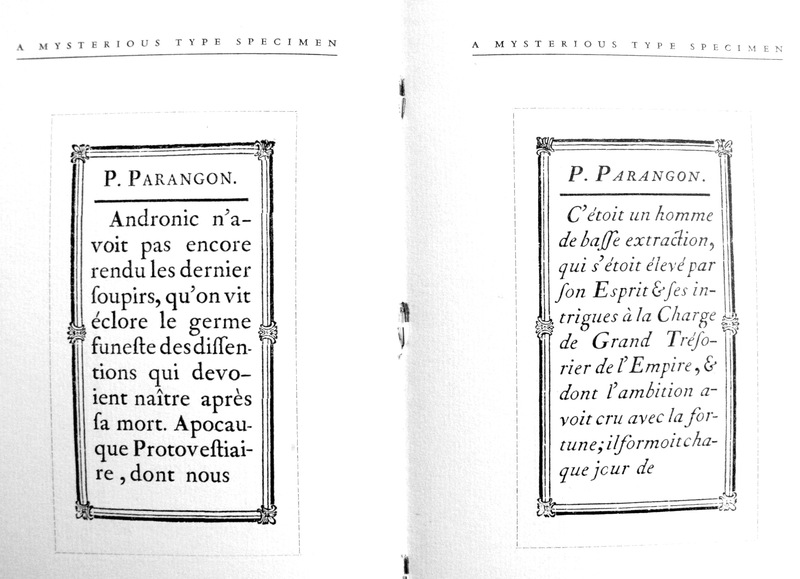 A classical text typeface. Maga (2012). A text family. 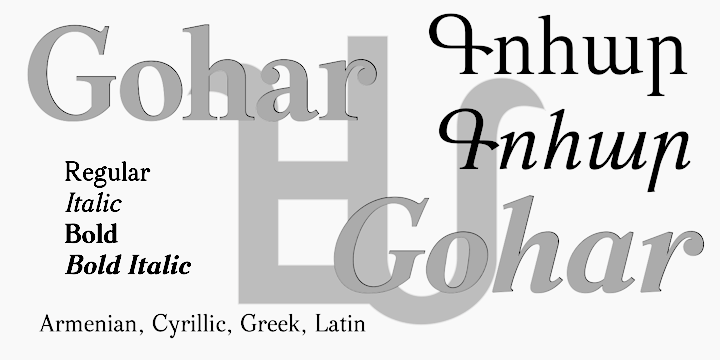 Methodo (2005): calligraphic penman typefaces. Monox and Monox Serif (1998-2000): a monospaced family. Ni Sans, Ni Slab, Ni Serif (2018). Musee (2006): a transitional family with ornaments and borders. Nerva (2004). A subdued Trajan typeface with flaring. Nyte (2012). A serifed text family. Plexes (2003). See also Plexes Pro (2006). 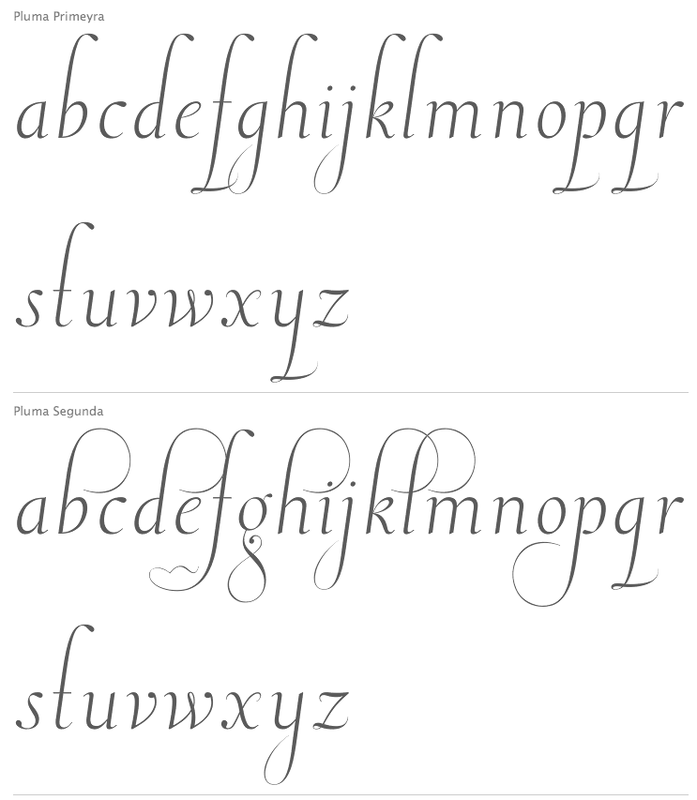 Pluma (2005): a series of three exquisite calligraphic flowing scripts called PlumaPrimeyra, PlumaSegunda and PlumaTerceyra). Inspired by the typographic work of Manuel de Andrade de Figueiredo that was published in 1722: "Nova Escola para Aprender a Ler, Escrever e Contar, offerecida a Augusta Magestade do Senhor Dom Jao V, Rey de Portugal". Prelo (2008): A sans family for magazines, it has styles that include Hairline, Hairline Italic, Extra Light, Extra Light Italic, Light, Light Italic, Book, Book Italic, Medium, Medium Italic, Semi Bold, Semi Bold Italic, Bold, Bold Italic, Extra Bold, Extra Bold Italic, Black, Black Italic, Slab and Prelo Condensed. Priva Pro (2006): a sans family that includes Greek and Cyrillic). Prumo (2011-2012). A 92-font family originally created for the redesign of the Argentinian newspaper La Nacion. Released to the public in 2013, it covers low and high contrasts, and has slab serif styles as well as Scotch Roman styles. So, it is more a type system or type collection than one single typeface: Prumo Banner, Prumo Deck, Prumo Display, Prumo Poster, Prumo Slab, Prumo Text. Quaestor and Quaestor Sans (2004). 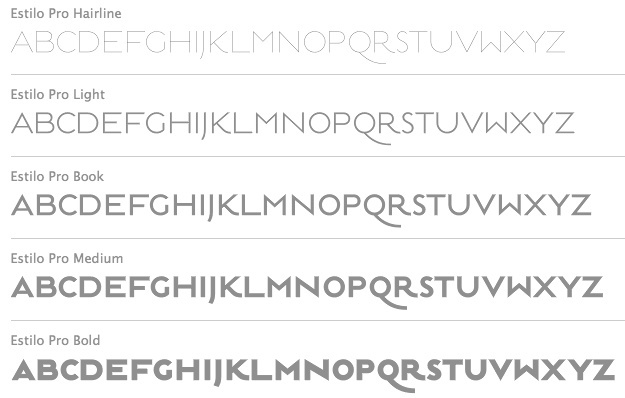 Roman inscriptional typefaces. 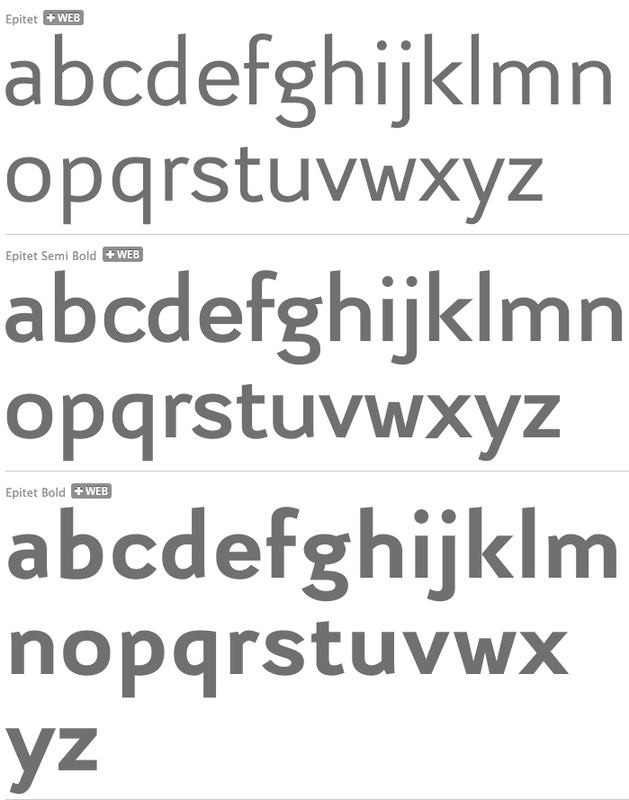 Resea (2004) and Resea Consensed: Bank Gothic style typefaces. Solido (2012) is a versatile type system with five widths: Solido, Solido Constricted, Solido Condensed, Solido Compressed and Solido Compact. 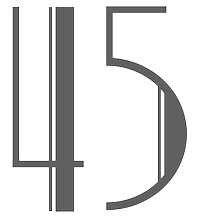 In total there are 35 fonts. Codesigned with Pedro Leal. 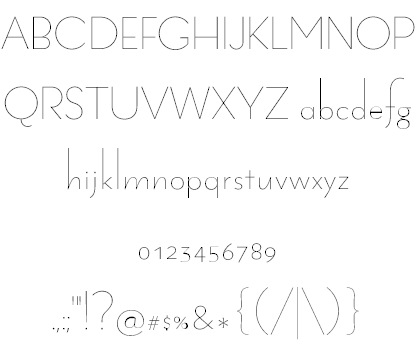 Synuosa (1999): an experimental typeface showing only the top half of the characters. Tecla (2018). 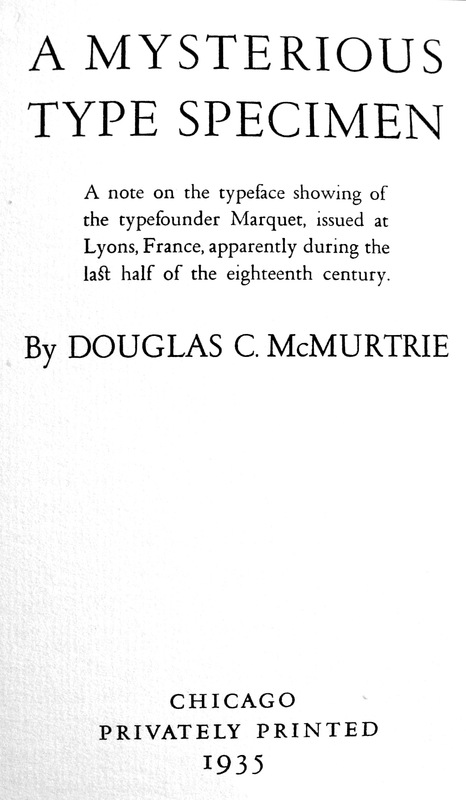 After Printype, a typeface developed in the early twentieth century for the Oliver Typewriter. Titan and Titan Text (2003). 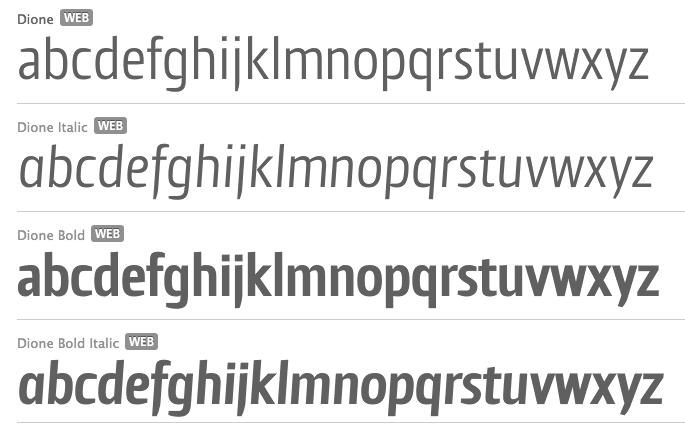 User (2012), User Upright (2012), and User Stencil (2012). Monospace type families. Velino (2010): an extensive family including Velino Text, Velino, Velino Condensed, Velino Compressed, Velino Poster, Velino Sans, Velino Sans Condensed, Velino Display (+Compressed Display, +Condensed Display). This didone superfamily is sure to win a ton of awards. Ventura (2007): based on the calligraphy of Portuguese calligrapher Joaquim José Ventura da Silva, ca. 1802, who wrote Regras methodicas para se aprender a escrever os caracteres das letras Ingleza, Portugueza, Aldina, Romana, Gotica-Italica e Gotica-Germanica in 1820. It had a "Portuguese Script". 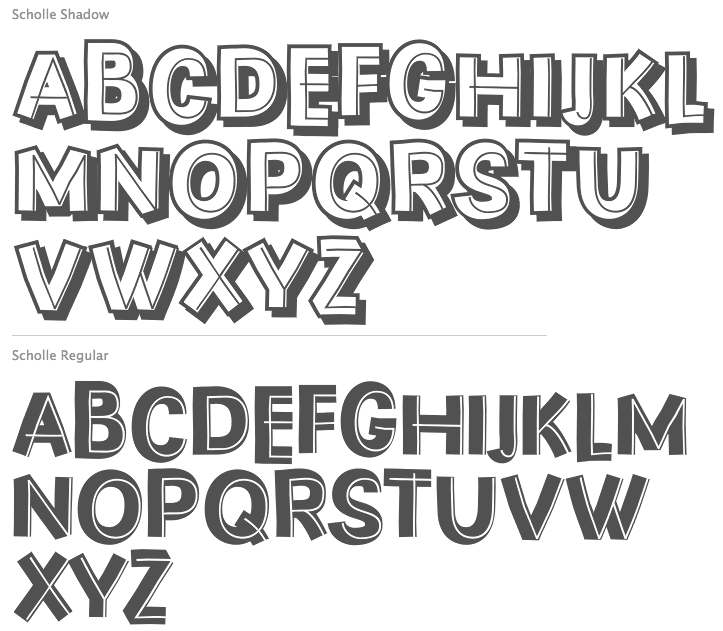 Do not confuse Ventura with Dieter Steffmann's font by the same name made many years earlier. Ventura won an award at TDC2 2008). 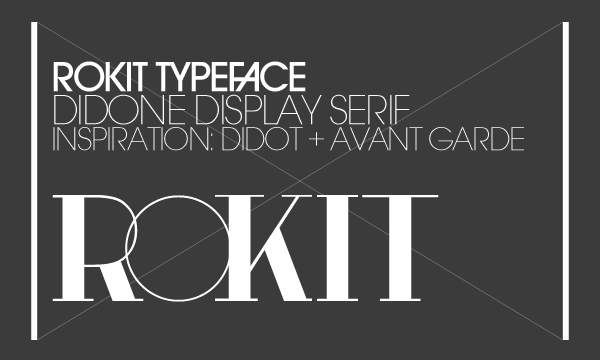 Viska (2015, by Dino dos Santos and Pedro Leal) is designed for small print. Volupia (2005): a connected advertising face. 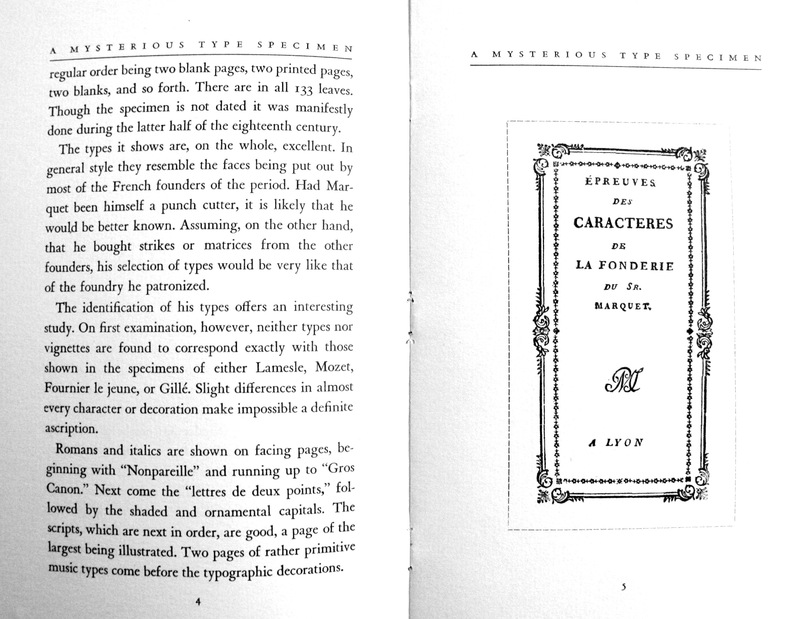 DS Type also has typefaces by other type designers, such as Pedro Leal. They worked with leading companies, world scale events and well-known design agencies including: Appetite, Banco CTT, Banco Economico, BBDO, CondéNast, CTT Correios de Portugal, Electronic Arts, Errea Communicacion, Erste Bank, ESPN, Expo 2020 Dubai, Fifa World Cup 2018 Russia (the Ducha typeface), Garcia Media, Gatorade, Gruner + Jahr, Hearst, Innovation, King Games, McCann-Erickson, Meredith, Palmer Watson, Pentagram, Sagres, Starbucks, The New York Times (the Nyre typeface), Vox Media and Wolff Olins. 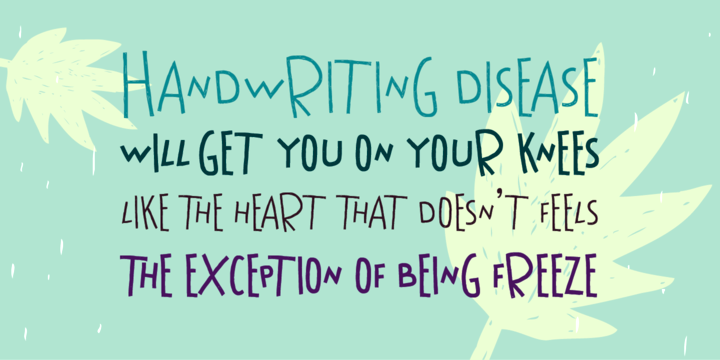 Dusan Script (2009, Ascender: a monoline informal hand-printed script). Artvod (2009, slabby and octagonal at the same time). Qiltray (2009, handwriting for long texts). 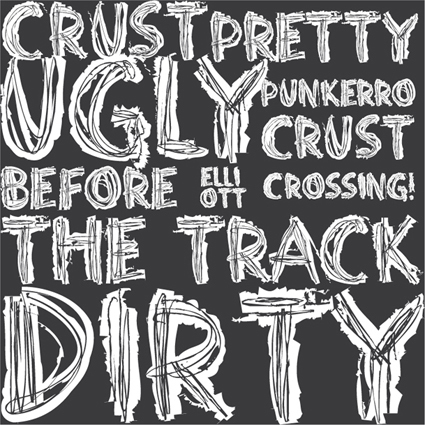 Punkerro Crust (2009, delicious scratchy type). 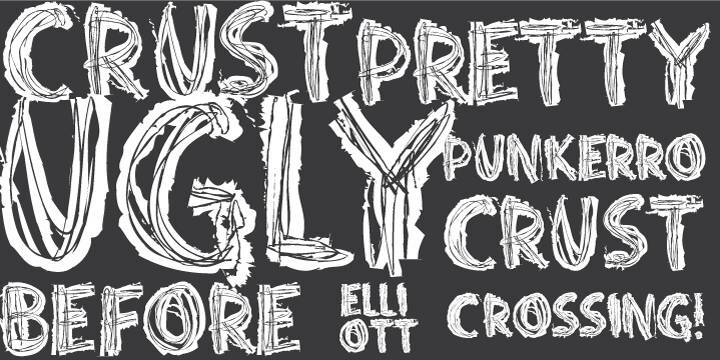 Rough the Type (2009, blackboard style). Sensor (2010, an ink-trap monoline face). Enforcer (2010, an elliptical headline sans). 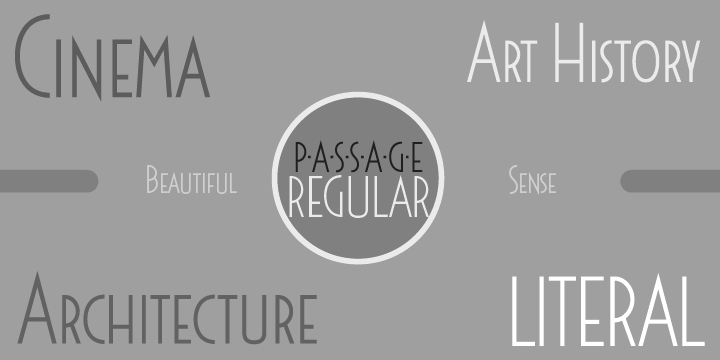 Passage (2010, a great art deco family, including Initials and Borders). Amanet (2011). 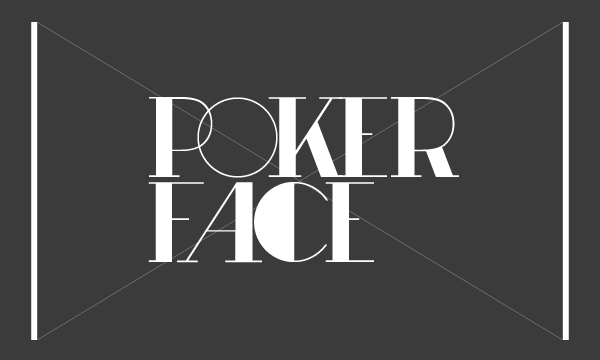 A flared display face. Osmacka azbukovica (2011). 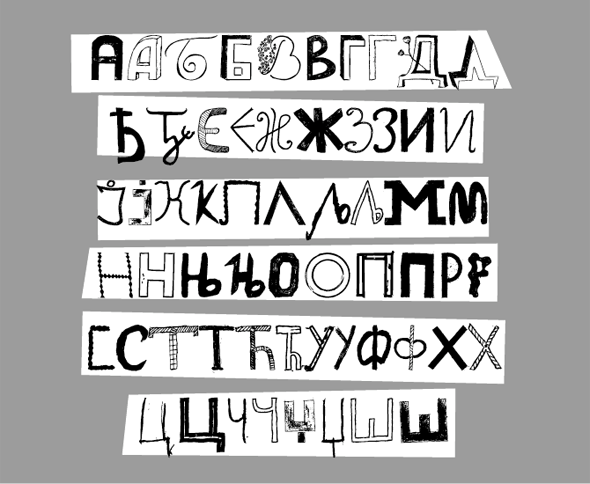 A Cyrillic font made by his kids in school. 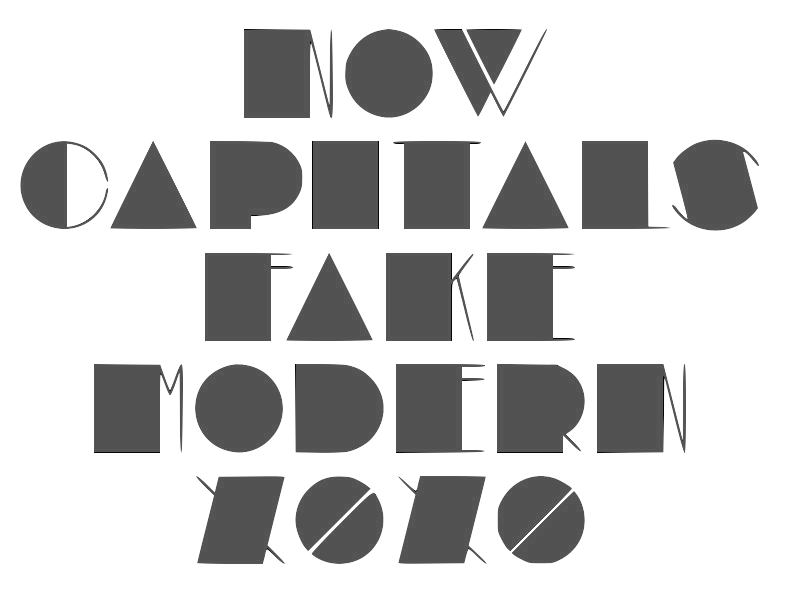 The clean-cut semi-humanist sans family Centim (2011). The Egyptian typefaces Saxophone Soprano and Saxophone Baritone. 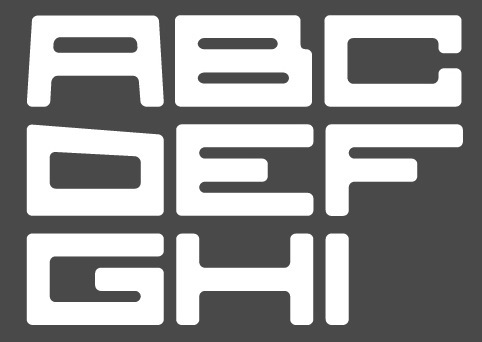 Debelly (2011), one of the best typefaces to come out of Tour de Force. 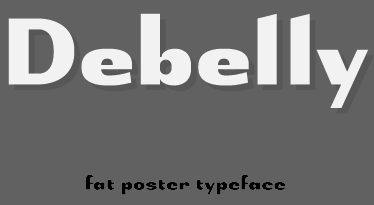 They say about this elegant fat poster face: Debelly is catchy fat typeface, with lovely geometric shapes. Inspired with contrast strokes, with square joins, Debelly gives an impression of retro style combined with contemporary trends. It is designed specially for packaging, posters, logotypes or headlines, even it can be pretty handfull in smaller sizes. Contains 375 glyphs. Epitet (2011). 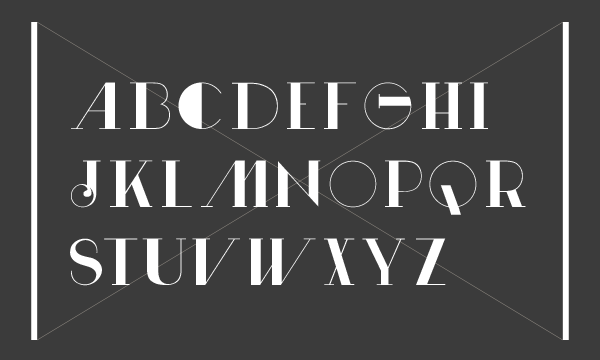 A simple monoline family built around elegant elliptical shapes. Refren (2012): A monoline script face. Equator (2012): An avant-garde caps headline family. Brisko Sans (2013). A straightforward sans family. Extended to Brisko Display (2012). A day before Serbia was crushed by the Belgian soccer team, Dusan published the organic sans typeface Publio (2013). Kamenica (2013). 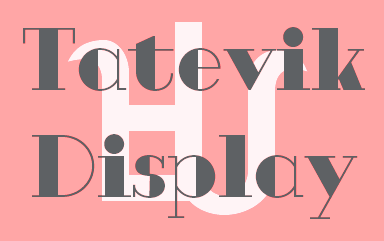 A display sans. Followed in 2017 by the gorgeous Kamenica Texture typeface family. Nervatica (2013). A children's book font. 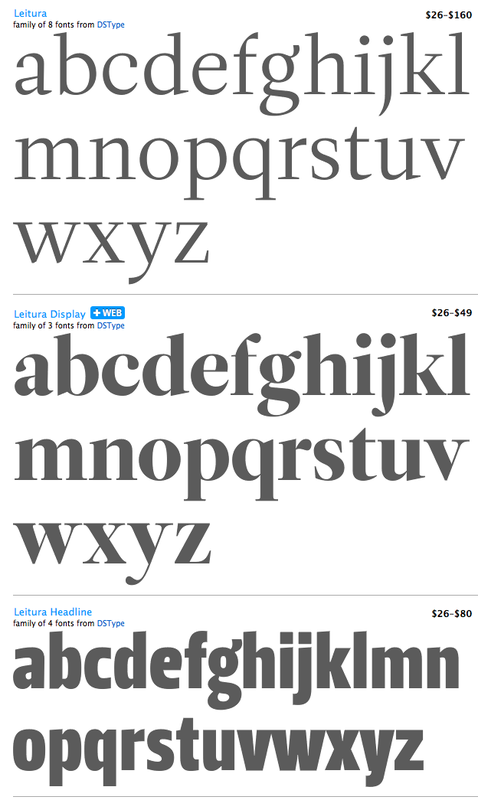 Lasta (2013) is an informal serif typeface advertized as poetic. Selektor (2013). 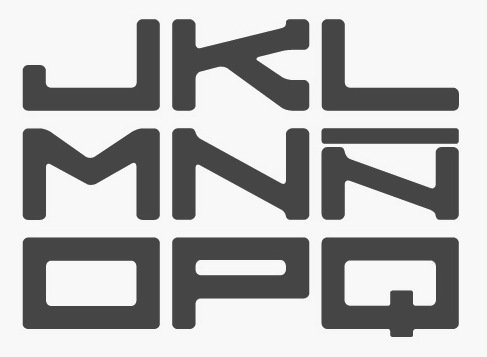 A geometrical almost techno sans family. This was followed by Selektor Slab (2013). Bartender (2013). A copperplate typeface. Lumier (2013). 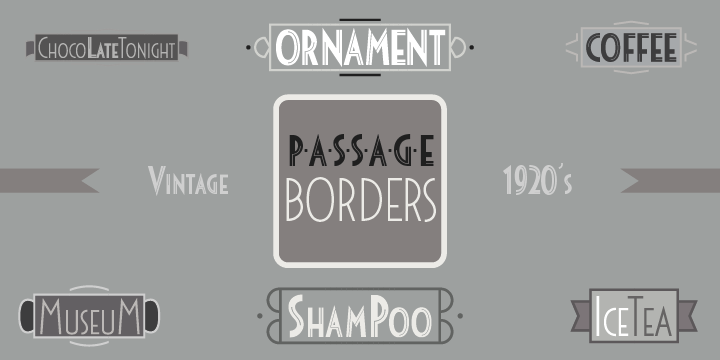 An all caps geometric sans family inspired by art deco posters from the interwar period. Followed by Lumier Texture and Lumier Rounded (2018). Scholle (2014). 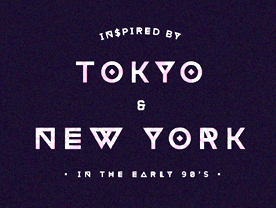 A bouncy two-style inline family with cartoonish elements. Hedon and Hedon Display (2014). 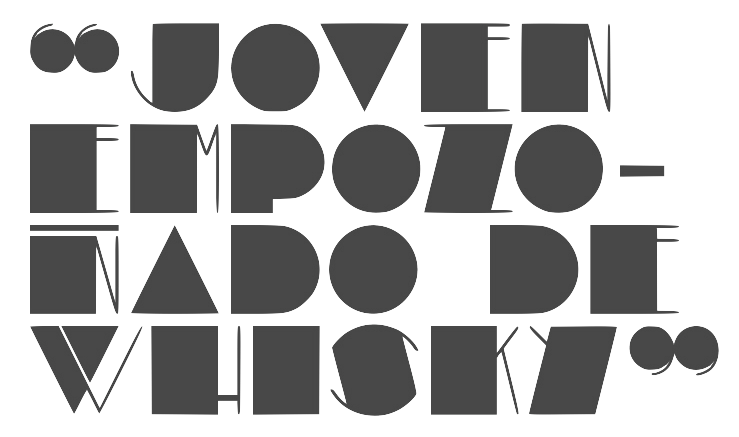 A hedonistic sans that exhibits the sort of contrast one finds in inscriptional types. Lumberjack (2014). A bouncy fat cartoon typeface. Not to be confused with Thiago Bellotti's Lumberjack (2013, Mushroom Type), it was renamed 24 hours after its first appearance to Lumberjacky. Trampoline (2014). 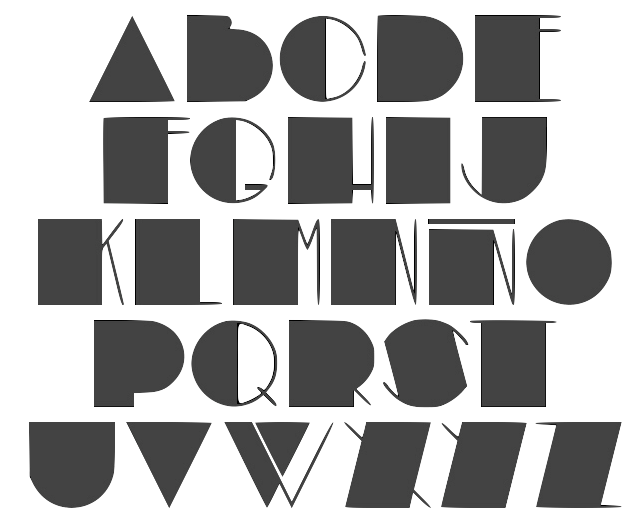 A funky typeface. Dondolare (2014). 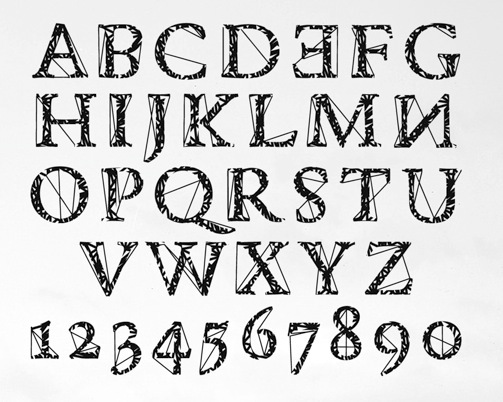 A primitive hand-drawn typeface. 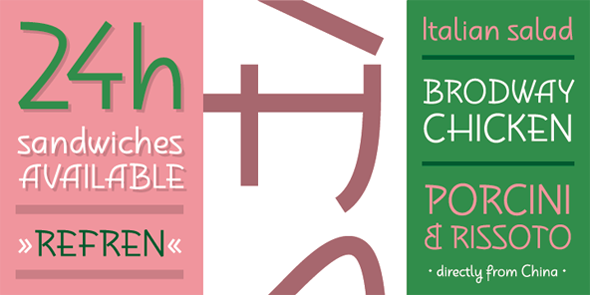 Balcon (2014) and Balcon Round (2014, a condensed rounded sans). Scripton (2015). An urban wall brush type. 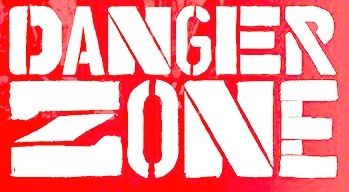 Manzello (2015: a workhorse text typeface). Pleyo (2015). Hand-crafted, perhaps for children's books. Fartitudo (2015). Just for the name alone, this typeface deserves a medal. Fartitudo is a 3-style hand-crafted all caps poster family in a genre that was kickstarted by Pintassilgo in Brazil. Dambera (2016) and Dambera Retro (2016). A connected script, perhaps suitable for children's books. Crazymond (2016). Hand-crafted semi-connected script. Lunatino (2016). A poster script. Plonker (2016). An all caps hand-printed typeface. Fine New Bonbons (2016). A quaint candy store script. Napolitanka (2016). A delicate high-fashion hifgh-contrast didone. Businessland (2016). 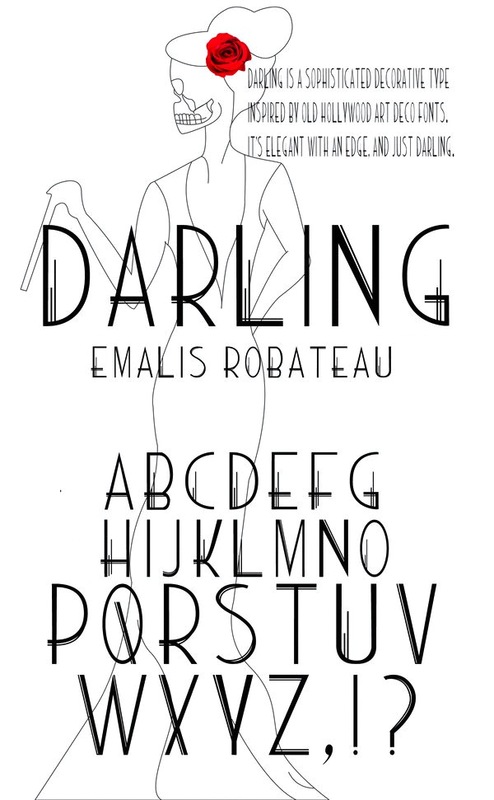 A rough hand-crafted poster typeface. Escondida. A high-contrast connected script. Alonga (2017). A serif family with considerable contrast characterized by sharp triangular serifs. Nula (2017). 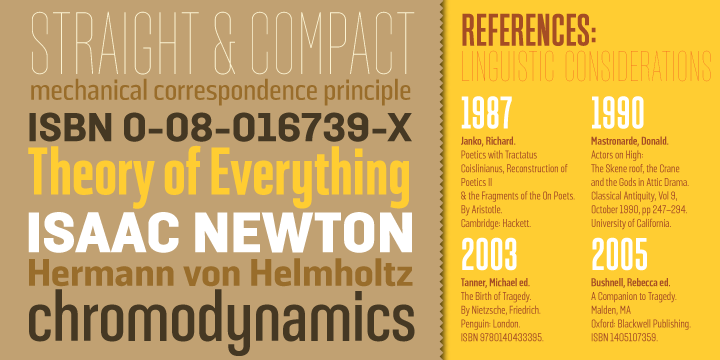 A 22-style humanist sans typeface family. Mymoon (2017: a geometric sans in 22 styles), Mymoon Stencil, Mymoon Stencil Texture. Landsick (2018). An intense script. Blond (2018). A sans family that tends towards the humanist side. Penfriend (2018). A script typeface. Modny (2018). A fashion mag Peignotian sans family with a gorgeous inline style. Stropha (2018). A compact slab serif family. Hlad (2018). 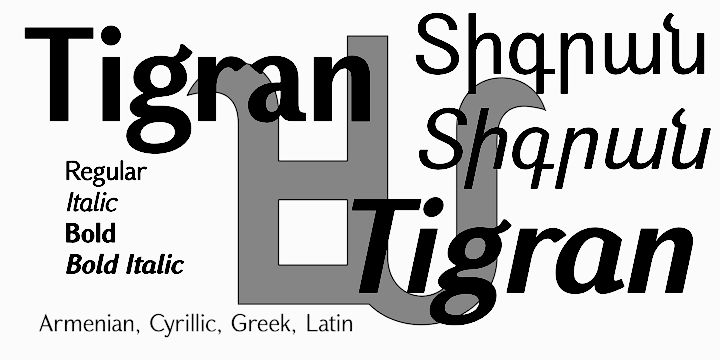 A distinguished 5-weight incised / lapidary typeface family. Bogota, Colombia-based type designer who created the gorgeous tall-legged art deco typefaces Emblema (2014) and Emblema Headline (2014, Corradine Fonts). 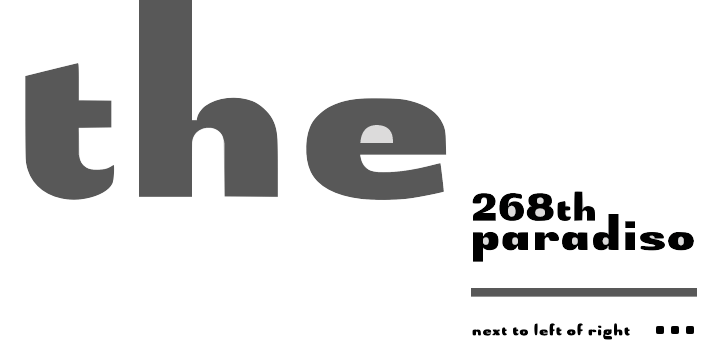 The latter 52-style typeface family can be layered. Typefaces from 2016: Triunfo (a curvy slab serif done with Manuel Eduardo Corradine). Bandung, Indonesia-based designer of these typefaces in 2017: Nine Tail, Meatballs (a layered signage script), Rohman, Roundfra (a modular typeface), the preppy handlettered typeface Mirinia, the brush font Hummer, the deco typeface Coet, the script typefaces Ghost (smooth and with high contrast), Ora et Labora, and Lisna, the hand-crafted Sild, the marker font Winkdeep, the brush script Oppy Sahra, and the art deco sans typeface Allorta. Basalt (1926). 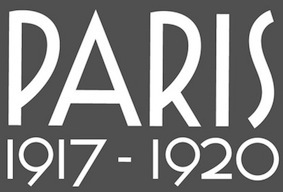 A pre art deco all caps typeface. 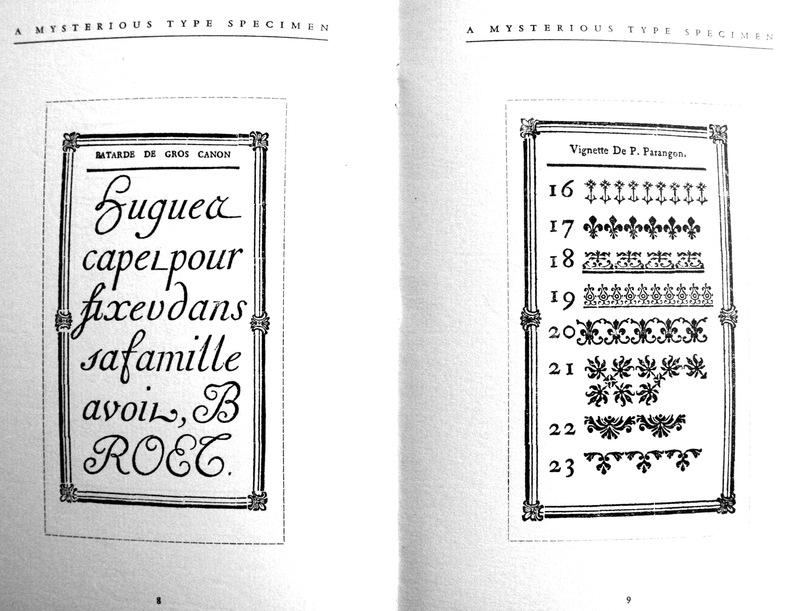 Ege-Schrift (1921, Genzsch&Heyse). Jaspert, Berry and Johnson mention 1927. Seemann says 1923. 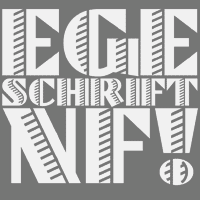 Ege Schrift NF (2011, Nick Curtis) is a faithful revival of Ege-Schrift according to Curtis. Ege Schmuck (1922, Genzsch&Heyse): ornaments for the Deutsche Druckschrift (Heinz König, 1888). A digitization and extension called DeutscherSchmuck was done by Manfred Klein and Petra Heidorn in 2004. 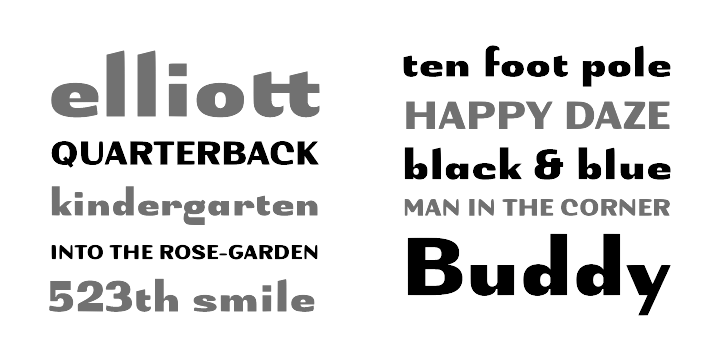 Manfred added Druckschrift Initialen also in 2004. Fiori Schmuck (for C.E. Weber): floral decorations. Sao Paulo-based designer, b. 1985. 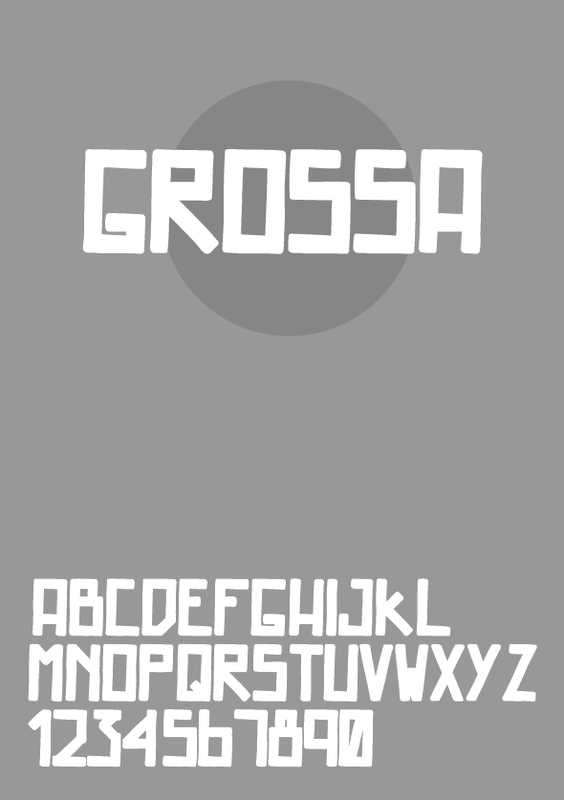 Creator of the experimental typeface Jesus Chorou (2010), the alchemic typeface Shuv (2013), the art deco typeface Terecodeco (2012) and the poster face Grossa (2010). In 2013, he designed Cities in Construction. Ahora (2012). 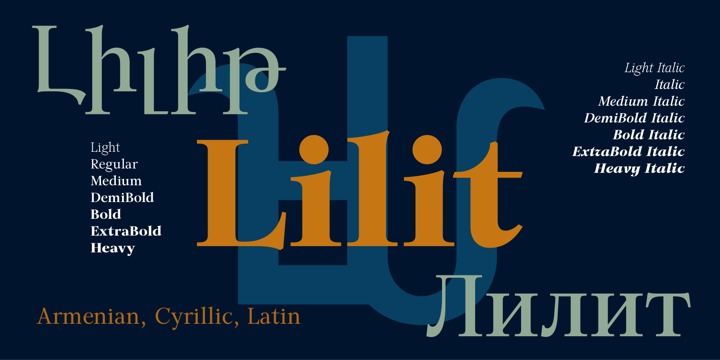 This typeface is based on an art deco design used in a San Salvador publication in 1943. Free download. Images of Ahora: i, ii, iii, iv, v, vi. Cronos (2012). 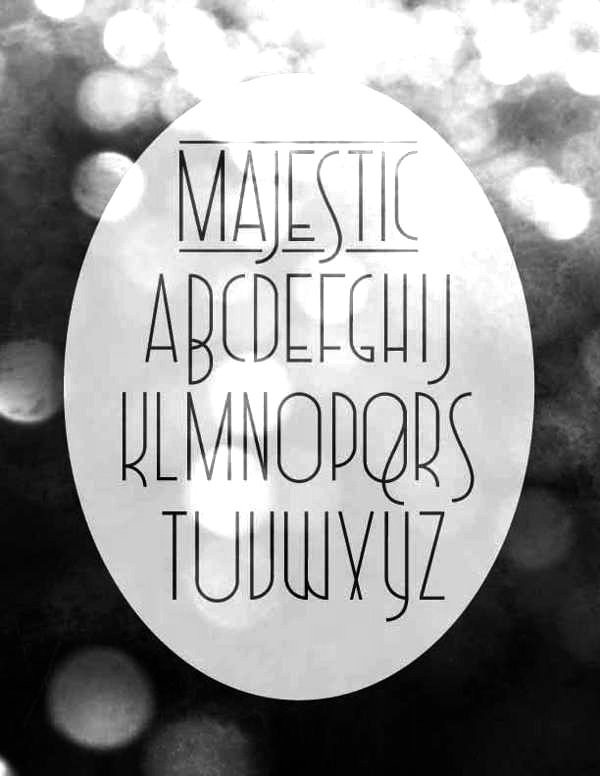 An elegant beautiful rounded poster typeface. Images of Cronos: i, ii, iii, iv, v, vi, vii, viii, ix. Art Deco fonts: Baha (1992), Broad Avenue, Hafnium, Haman Bold, Narcosis Oblique, Neaten, Orange Oblique, Ramose Oblique, Totem, Zyme Oblique. Bar Code fonts (Code 128, Code 39, UPC, 2/5 Inter, PostNet, EAN 8/13). 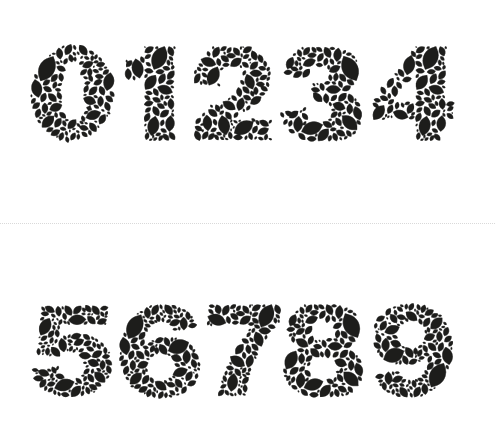 MICR or check printing fonts, including Mic-EarthNormal (1992). 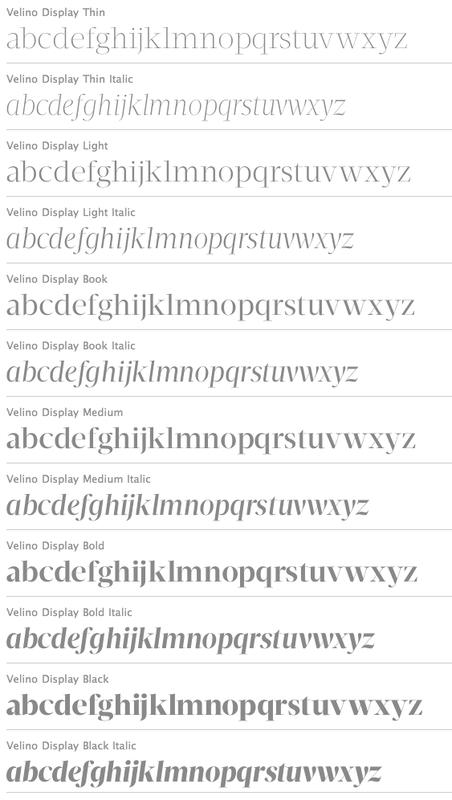 Display typefaces: AdrianneNormal, ApexCondensed-Oblique, BlackChanceryNormal, CoronetNormal, Dalith, ESFEliteNormal, Emir, Expiry-Oblique, Expiry, GrangeCaps-Oblique, GrangeCaps, Hafnium-Oblique, Hafnium, Harbor-Oblique, Hartebeest, Hasp, Hesitate, Jayhawk, JayhawkExpand-Oblique, JayhawkExpand, Jetty-Oblique, Jetty, Jevons-Oblique, Jevons, Jocund-Oblique, Jocund, Josephine-Oblique, Josephine, Josiah-Oblique, Josiah, Kansas-Oblique, Kansas, Kaufman, Kermis-Oblique, Kilung-Oblique, Lackey-Oblique, Lackey, Lactam-Oblique, Lactam, Langur, Lazar-Oblique, Lazar, Ligand, Liquid-Crystal, Liquid-CrystalOblique, Lunatic-Oblique, Narcosis, Nonage, OldEnglishNormal, Orange-Oblique, Orange, Pavis-Oblique, Pavis, Quintly, Rankle-Oblique, Rankle, Saccule-Oblique, Saccule, Tarunda, Totem, ZapChanceNormal, Zwieback-Oblique, Zwieback, Zyme-Oblique, Zyme. 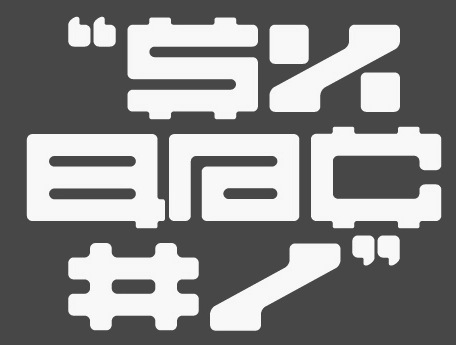 An oriental simulation face, EchoCaps (1995), is here. A partial list: 226-CAI978, Aacho, Aapex, Aaron Heavy, Adrianne, Advance, Advertiser, Agency, Alien-Tongue, Alonse, Amber, Antiquarian, Antique, Antique Olive, Aristocrat, Avante, BC93Circle, Baha, Bahase, Bar Code 25, Bar Code 25 Interleaved, Bar Code 39, Bar, Bearer 25i, Big City, Black Chance, Black Chancery, Blippo, Bodoni, Broad Avenue, Broad Street, Brush, Bullet, Cal Zap Chance, Carefree, Cas Open Face, Century, Century School, Chicago, Circled Letters, CircledNumbers, Coach, Codabar, Code 128, Code 93, College, Commercial Script, Computer, Cookies, Cooper Italic, CooperBlack, CopperPlate, Coronet, Cursive Elegant, Dalith, Danley, DateLine, Deloise, Devotion, Dodge, DomCasual, Dot Matrix, EAN, ESF Deco, ESF Dingbats, ESF Elite, ESF Rounded, ESF-Elite, Earth, EchoCaps, Elegant Script, Elfring Elite, Elite, Emir, Engrave, Engraved, Expert Dingbats, Expert Elite, Expert Rounded, Expiry, Fashion, Flourish, Franzquo, Frit Qat, Fritz Quad, Friz Kat, Futena, Futura Black, Future, Garamond, Geometric Medium, Gillies, Gin and Tonic, Goudy Old Style, Grandam, GrangeCaps, Greece, Hafnium, Haman Bold, Hand Brush, Handel, Handsome, Hartebeest, Hasp, Heidelstein, Hellenic, Helv, Hesitate, Hobo, Hotpress, Illusion, Impact, Initial, Jayhawk, Jessica, Jetty, Jevons, Jocund, Josephine, Josiah, Jurassic, Kansas, Kaufman, Keys, Klefmon, LCD, Lackey, Lactam, Laguna, Langur, Lazar, Lenswith, Letter, Ligand, Liquid Crystal, Listium, MICR, Madison, MarriageScript, Micro, Microstile, Montana, Mossman, Mossy, Narcosis, Neaten, Next Trek, Nonage, OCR A, OCR B, Old English, Orange, Park Place, Park Street, Pavis, Pelicent, Penoir, PlanetEarth, Playful Print, Postal, Precidio, Prestige Elite, Query, Quintly, Ramose, Ranch, Rankle, Ransom, Revenue, Revue, Risky, Rockford, Roman, Saccule, Saffron, Salamander, Sans, Sci Fi, Script-Roundhand, Secure, Shaundow, Stensil, Tarunda, Technical, TiffBlack, Titanic, Totem, Toto, Trumpet, UPC, Umbles, Umpa, Un Gard, University, Vantrel, Vingy, Wolton, Yarnell, Zanders, Zap Chancery, Zap Dingbats, Zodiac, Zwieback, Zyme. Notable (2018, Google Fonts). 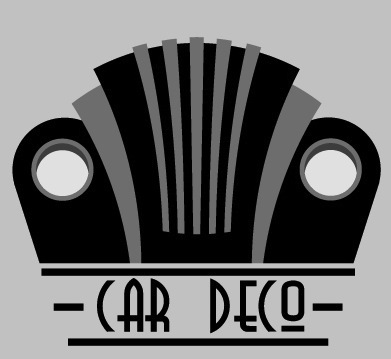 Co-designed by Eli Block, Hana Tanimura and Noemie Le Coz, the art deco typeface Notable is an uppercase sans serif display font; its letterforms are based on those found on U.S. currency. Notable was designed for Notable Women, an initiative by former Treasurer of the United States Rosie Rios. Notable Women is an augmented reality experiment that lets anyone see 100 historic American women where they have historically been left out: U.S. currency. Gene (2018). A small, round text typeface for print and web. Born in Cambridge, MA, in 1970, and educated at the Rhode Island School of Design (1988-1993), Eliabeth now lives near New York City where she is Principal of Elizabeth Cory Studios. From 1993 until 1995 she was senior font designer at Font Bureau, and from 1996-1998, she was font manager and designer at Meta design in Berlin. Agfa Creative Alliance designer who made the art deco all caps typeface Brok (1995), which first appeared in 1919 as poster letters cut in wood by Chris Lebeau for the Willem Brok Gallery in Hilversum, Holland. 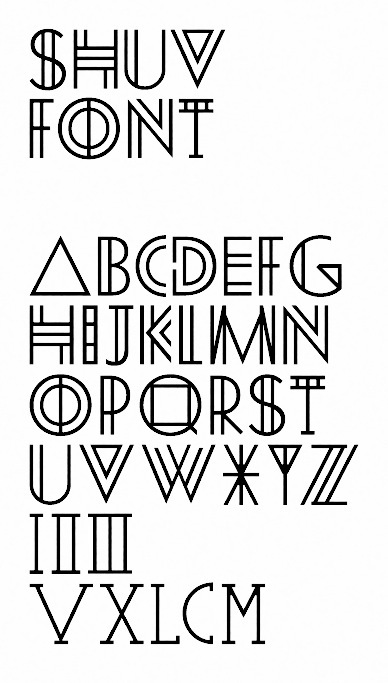 At Font Bureau, she designed the heavy geometric slab serif family Constructa, which is based on Morris Fuller Benton's 1934 ATF design called Tower. Emil Kozole (Ljubljana, Slovenia) studied communication design at Central Saint Martins London. 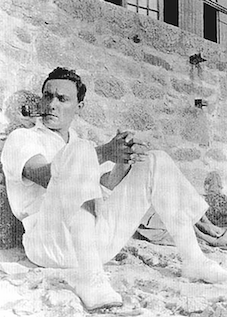 His type foundry is called Ljudje. Emil created the slab serif typeface Sarajevo (2012), Icons Night Out (2012), the artsy art deco typeface Typometry (2012, Ten Dollar Fonts) and the information design typeface family Signalia (2012). Free download. Attitude (2013) is a 7-style semi-alchemic typeface family. 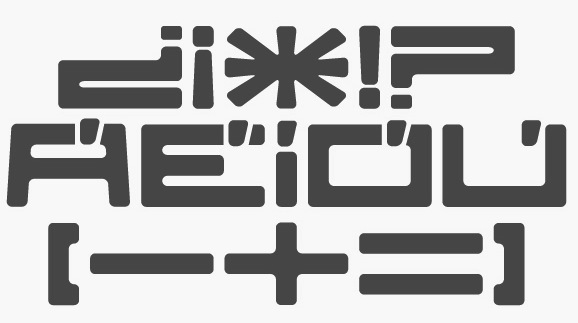 Random (2014) is a large and very pretty ransom note family. In Project Seen (2014), he provides three free typefaces, See Underline, Seen Strikethrough, and Seen Blackout, that make use of Opentype tables to automatically censor words the NSA is looking for in text monitoring programs according to an NSA Prism database of terms originally leaked by Edward Snowden in 2013. In 2015, he designed the monospaced typewriter typeface Resolution at The Designers Foundry. Lukasz Kulakowski, a Polish graphic designer in Dublin and Baile Atha Cliath, Ireland, created the free typeface Mosaic Leaf (2011), which was inspired by Akzidenz Grotesk typeface. In 2012, he published Orbits (a prismatic multiline face, done with Zbyszek Czapnik). 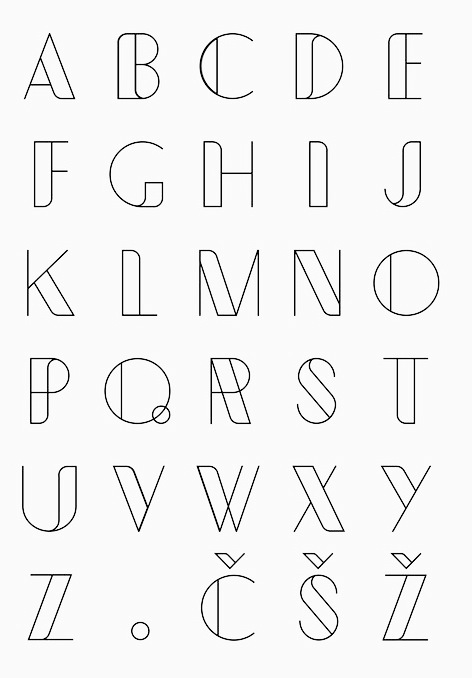 Typefaces from 2013 include the free display typeface Rhubarb Display Font (a condensed art deco sans caps family for Latin and Cyrillic done with Zbyszek Czapnik). In 2014, he created the tweetware font Christmas Time.